London Music Show 2010 is the greatest show on Earth for people who love music. From 8-10 October, ExCel London will be transformed into a world buzzing with music and creativity. At London Music Show 2010 you can look forward to interactive lessons from famous musicians, invaluable advice on how to make it in the music industry and unmissable performances from exciting star guests. This year, London Music Show 2010 will be split into four zones, specially designed to suit your interests: Guitar Zone, Technology and Sound Recording Zone, Rhythm Live and the Unplugged Zone. Each zone will be packed with the latest gear and give you the chance to pick up tips from the experts. Tickets have just gone on sale and there have been plenty of amazing announcements! • Fender is giving away a guitar every hour for the duration of the three day show! • Joe Bonamassa has confirmed he'll be running a special blues masterclass to learn from him first hand on the Friday (8 October) of London Music Show 2010. Space is strictly limited to 150 places at £30 each and the masterclass session will be followed by a signing session for ticket holders. Tickets can be booked here. • British acoustic star Newton Faulkner has also been confirmed for the show's Guitar Zone, run by MusicRadar's sister magazine Guitarist, Total Guitar and Guitar Technqiues. Newton will give a lesson in percussive playing aimed at all levels of player and also appear on the Live Hall stage to perform. • Guitarist magazine's Guitarist Of The Year competition is back - a three category contest to showcase the very best new talent amongst electric, acoustic and young guitar players. You can read the details and enter here. • London Music Show 2010's drum area Rhythm Live is run by our sister magazine Rhythm and they'll be bringing the best of British to the show. Ian Matthews (Kasabian), Dave Mackintosh (Dragonforce), Karl Brazil (Feeder/Robbie Williams) and session supremos Ash Soan, Clem Cattini and Ian Thomas (alongside bassist Laurence Cottle) have already confirmed. Drum guru Martin Ranscombe will also be on hand to tell you all there is to know about the art of tuning. 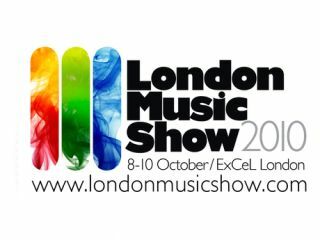 • Keeping it drums, Steve White and Craig Blundell will be performing a special set on the London Music Show Live Stage. • Lastly, Rhythm's Drummer of the Year competition is in full swing - read all about it and enter here. The final with be held at London Music Show on Sunday 10 October. Tickets to London Music Show 2010 have just gone on sale and selling like - yes - hotcakes - but why buy when MusicRadar can give you the chance to win them gratis? We've got one main prize up for grabs - a pair of weekend passes (Sat 9 and Sun 10 Oct) including entrance to the Saturday evening gig. There are also eight runners-up prizes of day passes (choice between Sat 9 and Sun 10 Oct) for those who don't bag the top price. Just click here to enter - and good luck!